If you’re in the mood at the moment to give your kitchen a facelift, but want a more affordable option, have you considered refacing your existing cabinetry? Believe it or not, it’s pretty remarkable what a little veneer and some new cabinet doors and hardware can do to brighten up an outdated space. Cabinet refacing is a very affordable kitchen design idea, with the average homeowner spending about $6,600, according to HomeAdvisor.com. It is eco-friendly, and also much less intrusive than replacing your cabinets. Cabinet refacing is the process of replacing doors and drawer fronts, and using veneer on the cabinet boxes of your kitchen’s current cabinets. Essentially, it’s like giving these areas a major facelift. The refacing process itself typically involves installing new cabinet door and drawer fronts, and covering the frames of the cabinets with a complementary wood or veneer. The best part about the process: with this kitchen design idea, the layout and structure of your kitchen cabinets remain the same, they are simply freshened up with a new, updated look. While it ultimately depends on the specific contractor doing the work, as well as the size of your space, most kitchen cabinet refacing jobs can be completed in less than a week. This is a huge benefit not only with regards to price tag, but also, most homeowners are still able to use their kitchen space while their cabinets are being refaced. Plastic laminates are available in a variety of solid colors and wood-grain looks (most laminates aren’t as durable as RTFs). Laminate is a little more expensive than RTF and are limited to plain cabinet door styles when compared with RTF. RTF is a very malleable, vinyl foil pressure-molded over medium-density-fiberboard doors. It can be shaped and molded in a variety of styles, such as arched and cathedral doors, and raised panel. While it comes in a fewer solid colors than laminates, its wood grain is made to look realistic. It’s also very durable and one of the most affordable of all of the finish options. Refacing a kitchen with wood can cost between 10 and 25 percent more than RTF and laminates, and it can be done in oak, maple, cherry, birch, walnut or pretty much any other wood a customer desires. These are by far the most expensive option and must be carefully sealed to protect against moisture. However, after sealing, the wood needs minimal care lasts much longer. 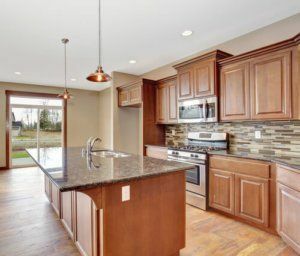 At Republic West Remodeling, we’re proud of the more than 17,000 home remodeling projects we’ve completed over the last 20+ years – kitchen and bath remodels, whole house remodels, home additions and outdoor living spaces – all projects that add value and function to our clients’ everyday living spaces. Contact us today to discuss your kitchen design ideas or any other remodeling project on your to-do list.